All bedrooms are south facing and have private parking, individual bathroom, reversible air conditioning and terrace with view over the mountains. 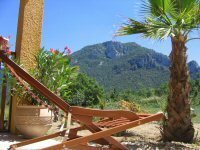 Between Perpignan and Carcassonne, at one hour from the ski runs or the Mediterranean beaches, at 5 minutes of Quillan with its facilities, it is the right place for a passive or active retreat on the mountain passes of the Tour de France, on the walking paths of the Canigou or for a visit of a wine cave or a perched cathar castle. From Carcassonne, direction Limoux. Cross Limoux, then direction Quillan. 4 km. after Quillan, the village of Belvianes & Cavirac.